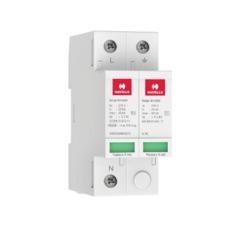 These are suitable for second level of protection in supply distribution panels in which Type 1 protectors are installed, or the first level ofprotection in residential, commercial or other applications not exposed to direct strikes or with no external lightning protection system.They are installed at the origin of the low voltage system or close to sensitive equipment to protect against transient voltages coupled into thelow voltage network. End of Life Indicator (Red & Green). High Terminal Capacity (35 sq. mm). Dual position of Din-rail clip for Installation. Protection in small module width. Faulty cartridges can be replaced without changing the entire SPD. Cartridges can be replaced with mains voltage ON. All cartridges are marked with characteristics for ease of maintenance. Option to remotely monitor the status of the surge protector. Simplified cabling thanks to a single terminal for monitoring all poles.